In the Blossom Cup vs Lena Cup battle, we’re looking at two very popular menstrual cups that are made in the USA. They’ve both come onto the scene in recent years, and have gathered thousands of excellent reviews over on Amazon. In terms of sizing, design and stiffness, these cups are really quite similar. It’s kind of a difficult choice to recommend one over the other, but we’ll do our best. People that try both these cups seem to really like them and they have some excellent user reviews. Let’s take a look at the Lena Cup and the Blossom Cup to help you figure out which one is best for you, and your body type. The Blossom Cup is a made in the USA menstrual cup that is quickly becoming one of the more popular options. It’s relatively new to the period cup world, but people love the affordable price that comes along with this top-quality cup. Over on Amazon, the Blossom Cup has thousands of excellent reviews, and a very good overall rating. Most of the negative reviews are about menstrual cups in general, and not specifically about the Blossom Cup. If you’re looking for an affordable alternative to some of the more established (more expensive!) brand names out there, then the Blossom Cup is one you’ll need to consider. Same quality, just a more affordable price-tag. The only real negative to the Blossom Cup is that the company doesn’t seem to quite have it all together. The product description on Amazon is incomplete. Answer to customer questions are a bit evasive. The website has a few issues with usability and looks like it was designed by an amateur. It’s for these reasons that we generally recommend the Lena Cup over the Blossom Cup. The Blossom Cup is very difficult to find in stores because it’s not as popular as something like the Diva Cup. In our experience, the best place to get is on Amazon. Prices are very competitive and shipping is free with Amazon Prime. The Lena Cup is a bit of a newcomer to the menstrual cup world, but it’s quickly becoming one of the most popular cups in the world. It’s made in the USA from top-quality, medical grade silicone people that try it seem to really love it. It’s easy to insert and remove, and most people find that it doesn’t leak. A previous (small) complaint about the Lena Cup was that it was too stiff. However, the company has released the “sensitive” version which is now one of the softer menstrual cups. Reviews over on Amazon are excellent, and the overall rating is very high. The only real negative reviews are from people who don’t like menstrual cups in general, and not about this specific product. The company hopes to put a top-quality menstrual cup in the hands of as many people as possible at a reasonable price. We certainly appreciate more economical, yet top-quality menstrual cup choices and we’re sure you do too. 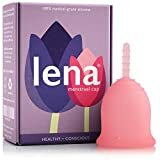 It can sometimes be difficult to find the Lena Cup in stores because it’s kind of a new menstrual cup. In our experience the best place to find it is on Amazon. There are two sizes of both the Lena Cup and the Blossom Cup: Small and Large. The small sizes recommended for younger people, or those who haven’t given birth vaginally. The larger sizes are for older people, or those who have given birth. In addition, there are two firmness options for the Lena Cup: regular, and sensitive. Softer cups can feel quite comfortable when inside, but are sometimes a bit more difficult to insert. Firmer cups are quite easy to insert, but can sometimes push strongly against the vaginal canal walls and cause some discomfort. Lena Cup vs Blossom Cup: The Showdown! As you can see from the above chart, the Blossom Cup has a lower capacity than the Lena Cup (23 + 28 ml vs. 25 + 30 ml). However, 2 ml difference for both the small and large doesn’t really make a big difference and isn’t really a factor. In reality, both these cups have an average capacity, and if you have a very heavy period, you’ll want to consider a high-capacity menstrual cup instead. In terms of length, the Blossom Cup is a shorter than the Lena Cup (by 5 + 9 mm). This can make a difference if you have a medium or short cervix. In this case, you’d probably want to consider the blossom Cup. However, if you have a high cervix/long vaginal canal, you’ll probably find that the Lena Cup is easier to remove. You should grasp the base and squeeze in to break the suction seal before removing a menstrual cup. But, if you have a long vaginal canal, your period cup might not be right at the opening. If this is the case, you’ll have to grab the stem and pull down a bit until you can get to the base. A longer cup can make this process a bit easier. Blossom Cup vs Lena Cup: Which One Comes Out Ahead? In reality, both the Blossom Cup and the Lena Cup are excellent menstrual cups and you’d be well with either of them. Both of them are made from top-quality, medical grade silicone. Although they’re new additions to the menstrual cup world, these cups are here to stay. We often recommend them ahead of the more established cups like the Diva Cup, Lunette Cup, or MoonCup because they’re often a bit cheaper. And essentially, you’re getting the same product. Both of these period cups have excellent reviews over on Amazon and thousands of satisfied customers. How Long is your Vaginal Canal? If you have a longer vaginal canal, you may want to consider the Lena Cup because you’ll find it easier to remove. If you have a shorter vaginal canal, then you want to opt for the shorter Blossom Cup. However, both of these menstrual cups can be trimmed easily (cut the stem) so you can make them into any length that you want. Are they Both Reputable Companies? If you take a look at the company websites, as well as the product descriptions and questions/answers on Amazon, the Lena Cup is far superior. They just look and feel like a totally legit company that is serious about women’s health. The Lena Cup company hopes to offer a top-quality cup at a reasonable price to as many people as possible. Sounds great, right? It is. As far as the Blossom Cup, it’s a little less professional. There is very little information in the Amazon description, vague answers to customer questions, and some weird stuff on the website like social media button blocking content that you’re trying to read. In terms of the overall feel of the company, it’s the Lena Cup for the serious win. This perhaps gives them the overall edge in the Blossom Cup vs Lena Cup battle! Lena Cup vs Blossom Cup: Which one comes out ahead? Leave your comment below and let us know your thoughts.